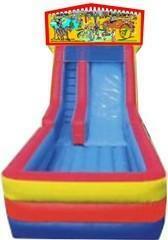 Them Slide Rental, local delivery, set-up, take down, and return. Includes stakes and/or sandbags/water containers for anchoring unit, ground cover and entry/exit mats. Includes 50' lighted electric cord and GFCI cord. Also includes proprietary online safety/supervision training and certification program. Requires one supervisor. This unit may not be used wet unless water element is provided and additional 'water use' fee is paid. Seasonal discounts may apply.